Lounge poolside while enjoying gulf view. Order lunch and a refreshing cocktail at the poolside bar & grill. Relax with a body treatment, facial, or massage. Located right on beautiful Clearwater Beach. Badfins Food & Brew and The Bait House are less than 5 min walk away from the resort. Don't feel like making lunch? The poolside bar & grill has you covered. Brush up on your game at Clearwater Country Club, just 14 mins away. 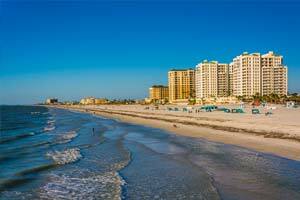 Florida's most densely populated county is chock-full of bustling Gulf Coast beach towns, each with its own unique flavor.